I woke up early this morning feeling ecstatic. 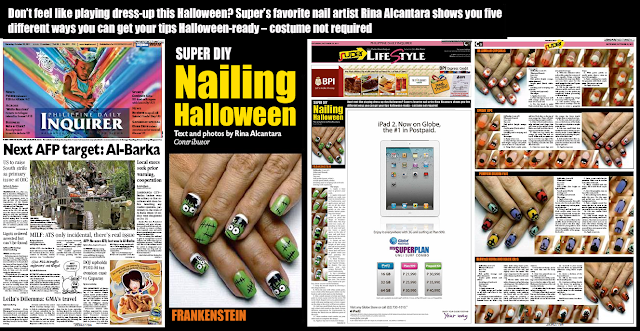 A few of my recent Halloween nail art designs were featured in today's Inquirer, a local newspaper. It has been 2 weeks since they asked me to write an article for them that would showcase some of my Halloween nail art ideas. The idea itself excited me. This would mean I'll be able to reach out to more nail art enthusiasts and hopefully some of my designs can inspire them. Perhaps it is shallow for some that I'll be saying how overwhelmed I was to see my work on a full page newspaper spread. But it really felt nice to see my nail designs printed in a national publication. I didn't expect the photos to be that big. Once again, thank you to Pam of Inquirer for this opportunity and for believing that my work is newspaper worthy. And of course, I can never forget to say thank you to my family and to all of YOU who support my art. Err ... I am now speechless! YOU ARE THE BEST, RINA. I WISH ONE DAY WE MEET, I HAVE ABOUT A MILLION OF QUESTION FOR YOU! Congrats Rins! Your nail art is beautiful and deserves national recognition! I am in the States and I only read 2 PI nail blogs... Yours and Pam's :) I am sure this article will bring you many new fans. Enjoy! Hopefully, I'll be able to do more features like this. It is so much fun and will probably always be a high for me. Congrats a million times =) You deserve it! im so proud of you rina! :) ang galing!